Here at Blue Valley, we have a vast amount of books in our library. However, there is more than one way to find and read a wonderful book. Audiobooks are very popular in recent trends as there are more than $2.5 billion in sales as of 2017, according to GoodEreader.com. 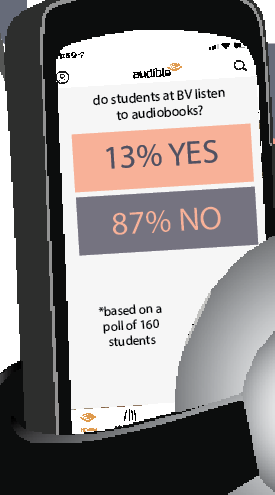 Audiobooks have quite a few benefits, some of which are for auditory learners. For instance, it is easier to learn how to use new vocabulary. However, that can have drawbacks by not knowing how to spell the word. Or in some instances, it can give the characters more life to them through speech than it would in the text. The narrator sets guidelines by having a set tone for the character; it helps the listener picture the characters better. Audiobooks allow you to listen to a book when you usually wouldn’t be able to read one — if you are driving or working out, you can’t read a book, but you can still listen to one. You can also listen to one while waiting to get out of the parking lot or taking a long flight. There is a large selection of audiobooks just like regular books. It is like having a virtual library at your command. As long as you have either downloaded it or have WiFi, you can listen to an audiobook of your choice. However, audiobooks are not for everyone — they can get expensive. You can subscribe to a service to get discounts on books or get some for free. Audiobooks also take up a lot of space compared to e-books. An e-book is just a book but on technology like the Kindle. Some books also have audio option with them so you follow along with the text. The audio will stop playing once you turn off the device. The audio compared to sites specified to audio books can lose their tone and sense of wonder for the character, so choose your audiobook platform wisely.